Chrome Autofill Viewer is a free program that allows you to easily see and delete all of your autocomplete data from Google Chrome browser. For those who don't know, the autocomplete data is what you type in the form fields while using the Internet. Your autocomplete data may contain your login name, pin, passwords, email, address, phone, credit/debit card number, search history, and etc. This program also allows you to view autocomplete data from a history file belonging to another user on the same computer or a remote system. 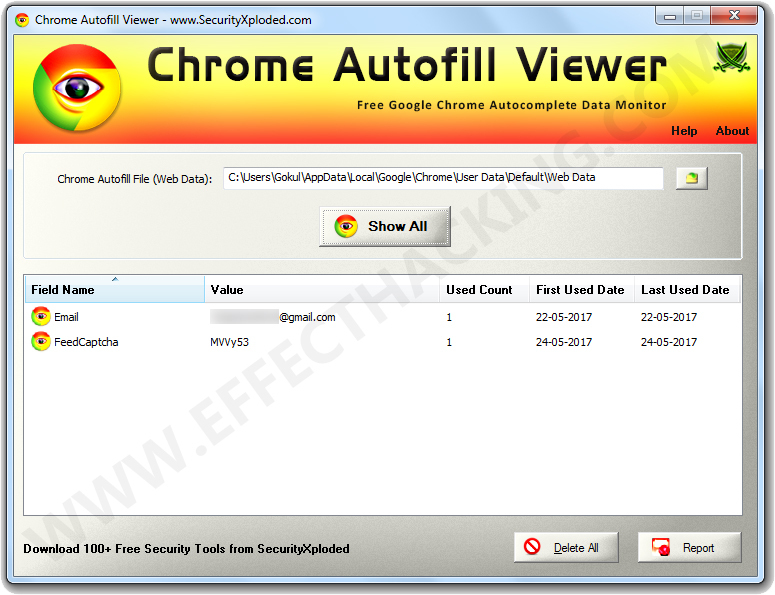 Since the Chrome Autofill Viewer is completely portable, you can run it from any location on your system or even from a USB drive. 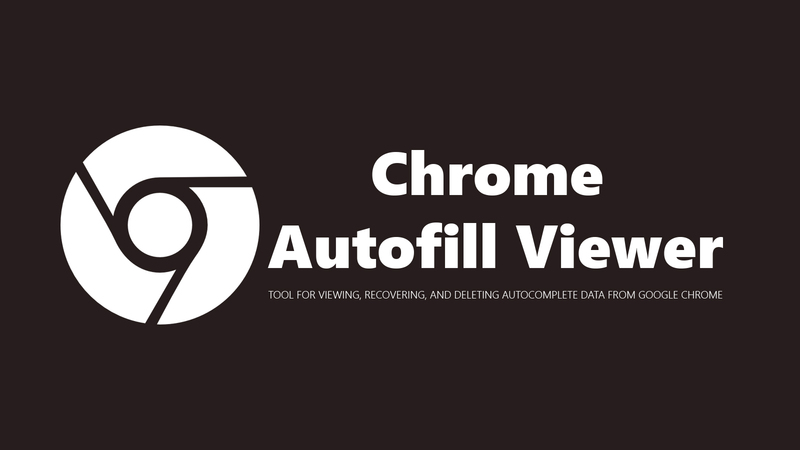 It also has the ability to automatically detect Chrome's Autofill file. The sort feature in this program can help you to arrange the data in various orders, which is really helpful for searching through 100's of entries. Chrome stores Autofill data in a file called "Web Data" within the profile folder. First, download Chrome Autofill Viewer onto your computer (download link is at the end of this article). 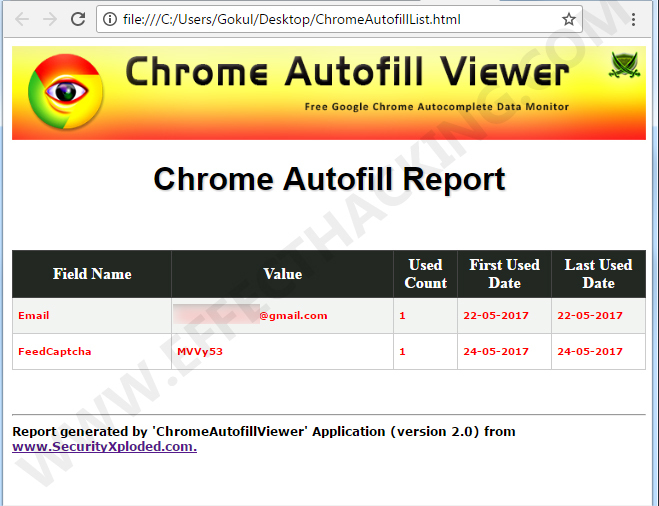 Then run the ChromeAutofillViewer.exe file, you will see a window as shown below. Now, click on the "Show All" button. All the stored Autofill entries will display in the window. As you can see in the above image, for each entry, it displays Field Name, Value, Total Used Count, First Used Date, and Last Used Date. Then click on the "Yes" button. If you want to save (export) the displayed Autofill list to an HTML/XML/TEXT/CSV file, click on the "Report" button. If you want to copy a particular value, right-click and select "Copy Value". When i run it on one of my computers (W7 x64) it shows up what it finds but before i can actually see any of them, the app crashes. Any clue?